CHARLESTON, S.C. — An expedition to bring back the remaining gold from a steamship that sank in 1857 off South Carolina in one of the nation's worst maritime disasters has recovered almost 1,000 ounces of gold - the first gold recovered from the wreck in almost a quarter century. The S.S. Central America was bringing gold back from the California when it sank in a hurricane claiming 425 lives. In addition, thousands of pounds of gold went to the bottom aboard the 280-foot, side-wheel steamship. About $50 million was recovered during expeditions to the wreck in the late 1980s and early 1990s before legal disputes shut down the operation. Odyssey Marine Exploration of Tampa, Florida, announced Monday that almost 1,000 ounces of the gold was recovered during a reconnaissance dive last month. The newly recovered gold includes five gold bars and two $20 Double Eagle gold coins. One of the coins was minted in San Francisco the year that the Central America sank. 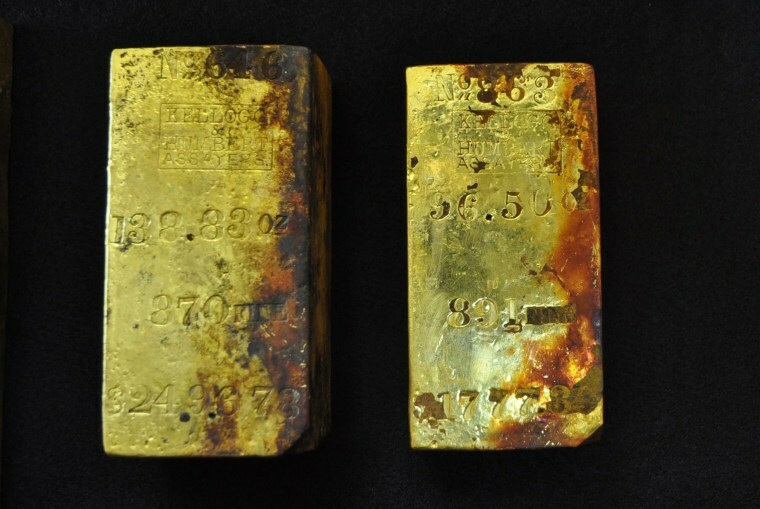 The gold bars weigh between 106 and 344 ounces. "While we weren't planning to recover gold so quickly, it did confirm that the site has not been disturbed since it was last visited in 1991 and there is gold remaining," said Mark Gordon, Odyssey's president and chief operating officer. An expedition that left North Charleston in April is expected to be on the site about 160 miles off the coast until late summer. Gordon said that in recent weeks the crew of 41 aboard the Odyssey Explorer has been conducting an extensive survey of the site and the recovery of more gold will begin once that is completed. It is not clear how much gold might remain. The ship was carrying gold bars shipped by banks and commercial interests. Passengers were thought to be carrying a lot of gold of their own in the form of coins — perhaps an amount equaling the commercial shipment.